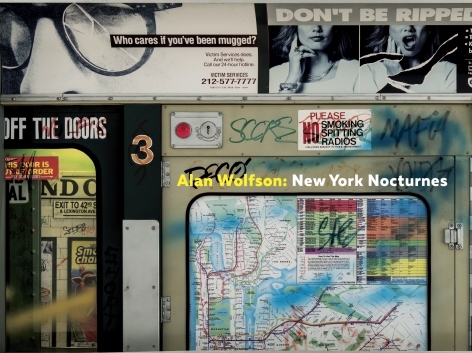 Signed and dated interior: "Alan Wolfson / 2008"
This November Hollis Taggart Galleries will present New York Nocturnes, an exhibition of the work of Alan Wolfson, a master of the diorama. The artist explores New York City with all its quotidian vices in intricately detailed scenes of the metropolis. 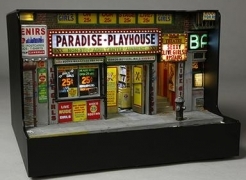 This exhibition will display a range of the artist’s miniature urban vignettes, each of which offer an intimate portrait of the city as seen through the grime and grit of its street corners, subway stations, and storefronts. Devoid of figures, Wolfson’s scenes are primarily focused on the architecture and design of his chosen urban locations, but most importantly on the leftover evidence of those city dwellers that have been and gone. Trash, cigarette butts, and graffiti all indicate the presence of people and yet the works are left empty, creating a world of possible narratives. As viewers, we become voyeurs peering into the unkept and lonely corners of the city that Wolfson invites us to explore. These elaborate snapshots are the result of months of extensive planning and research, with each detail having been meticulously crafted by the artist himself. Wolfson’s final sculptures represent a careful balance of the real and the invented, combining elements from memory, reality, and imagination. Alan Wolfson grew up in Brooklyn where began constructing assemblages and fostered a strong appreciation for art history as a small child. He was awarded his first solo exhibition in 1980 at Los Angeles’ Jacqueline Anhalt Gallery, a year after graduating from Humboldt State University. Wolfson has exhibited regularly in both solo and group settings since then, with notable exhibitions at the Museum of Art and Design, New York; the Vero Beach Art Center, Florida; and the Tel Aviv Art Museum.